Stunning views of Ford Lake abound from these ranch style units that are conveniently located within easy reach of I-94, Ann Arbor & Detroit Metro Airport. Resort style living close to nature with beautifully maintained tree-lined grounds. 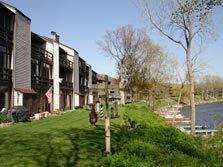 Private docks with immediate access to magnificent all-sports Ford Lake. Just click below for details of recent sales or available units at the North Point by the Cliffs.